The Japan Foundation, Los Angeles, and The United States Martial Arts Committee present the "United States Martial Arts Festival 2011" with the support of the Japanese American Culture and Community Center. Martial Arts is an extensive system of codified practices and traditions of combat, practiced for a variety of reasons including self-defense, competition, physical health, and fitness, as well as mental and spiritual development. 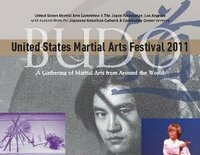 Budo performance admission include 16 martial arts performances, divided up into two sessions, organized by the Shin Koyamada Foundation and a panel discussion organized by The Japan Foundation, Los Angeles. "BUDO: Why Martial Arts is Needed Today"
Experts lead this discussion with the goal of showing how the spirit of BUDO influences people for world peace and introduce the audience to the spiritual beauty of Japanese BUDO. Call 1-888-507-3287 (Mon-Fri 9:00am - 6:00pm) or visit All American Tickets or US Martial Arts Festival website to purchase tickets. vkm . 更新日 11月 01 2011 3:11 p.m.